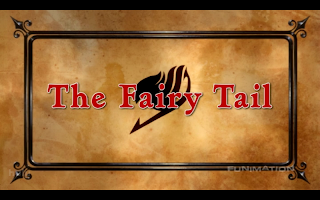 Four episodes of the Fairy Tail dub have been released on Funimation’s simulcast. I was originally going to review each episode as it came out, but that would be too much work. Sure I could use this as a chance to review all the episodes I never reviewed, but really, who cares? Instead I’ll give you a first look at the long awaited Dub, and we can see if it stands up to the original. I’ll save my commentary on following episodes for when I get my hands on the DVDs. When it comes to a dub there are two important parts. Namely, the performances by the voice actors, and the adaptive script. Are the voice actors right for their characters, and do the writers adapt the script without any serious loss in meaning? Since the first four episodes mainly feature the three main characters I will focus on them. Todd Haberkorn does a great job as Natsu. He manages to deliver a performance that not only captures the spirit of the original role, but also manages to taylor itself to the nuances of the English language. 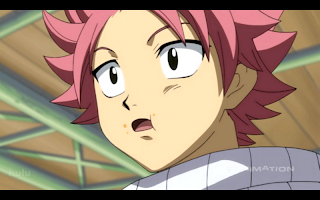 In other words, he has a distinctive voice that brings Natsu’s character to life, without sounding cartoonish. I’ve compared Happy’s voice to Chopper’s before, and I stand by that opinion. Tia Ballard manages to pull off a voice that is in the same vein as Brina Palencia’s Chopper voice, but doesn’t stray into pure imitation. Happy’s voice fits him well as the cute mascot character, but also as one of the primary sources of comic relief. Tia keeps the voice from getting too squeaky, thereby ensuring that her Happy voice won’t start to grate on the ears after listening to it for too long. 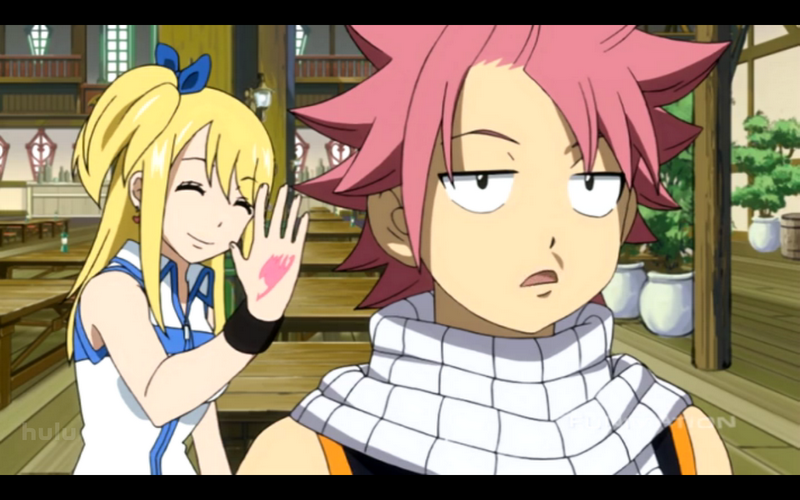 Cherami Leigh’s version of Lucy was the one voice that I was surprisingly conflicted about. While I did pick her as my choice for Lucy, I still felt like the voice was off. However, after that first impression the voice quickly grew on me, showing that it wasn’t bad, just different from Aya Hirano’s version of Lucy. 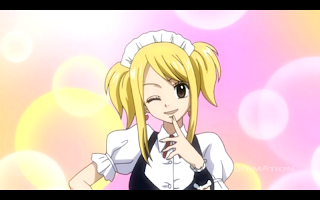 Cherami’s regular Lucy voice sounds a tad bit like her other roles, but she manages to nail Lucy’s personality perfectly. Especially in scenes where she is screaming. Cherami brings a lot of personality to the character, and I’d even go so far as to say that her voice work here has a bit more personality than Aya Hirano’s original. The entire cast is strong, with voices that match their characters. Some will take some getting used to, though none stand out as not fitting. Out of the few performances I’ve been able to see in the first four episodes I have to say that Christopher Sabat’s Elfman stood out the most. I love his work, but a lot of his voices sound quite similar. 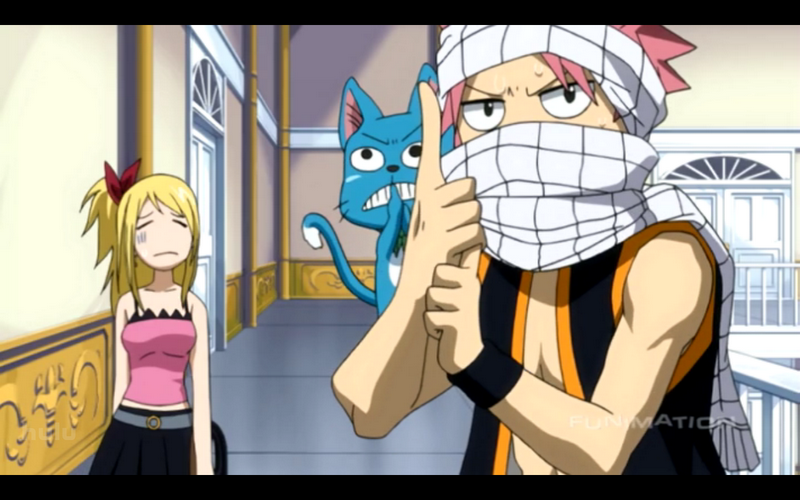 With Elfman Sabat took his trademark deep voice, and altered it subtly, but enough to set Elfman apart from all the other deep voiced characters Sabat’s voiced. I was worried that his prevalence in anime dubs would make him stand out, but he’s skilled enough to make the character his own. 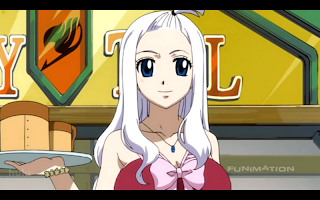 Out of the rest I have to say Mirajane stood out just as much. In this case I’m a little more skeptical on her casting. Monica Rial is a great voice actress, but her take on Mirajane is a bit too much “little girl” for my taste. I can hear some definite May and Momoka lingering in her performance, which sort of works for the sweet girl persona that Mirajane puts forth, but it doesn’t quite work for me. However, there was a moment, when she was talking about Natsu’s past, where her voice changed just a little bit for the serious scene. While I’m initially skeptical, I’m also looking forward to where Monica takes the character in later episodes. I’m looking forward to the release of the DVD set. So far FUNimation only has the first four episodes up on their website, and just based off of those I can tell that this is going to be a strong dub. I highly recommend pre-ordering the DVD set to any fan of the series. There may be a few voices that take some getting used to, but no bad voice actors were cast for any of the roles; and while not all are direct hits, none of them miss the mark by very far. With a faithful script added to the good casting, this series will be well worth the money. For anyone that hasn’t watched the series yet, I recommend checking out the anime. It’s a good adaptation of a good manga. Are you thinking they changed "I'm fired up" into "Now I've got a fire in my belly"? Because they didn't. The subbed equivalent of "Now I've got a fire in my belly" is "Now that I've eaten, I feel re-energized." Meaning he's re-energized by the fire he's eaten and is now in his belly. And trust me, reading the subbed version aloud sounds pretty tacky, so I'm glad they changed it. "I'm fired up" in the dub really is just that. Good catch. I just caught him saying I'm all fired up in later episodes (been watching the DVDs), I mostly heard him saying "I've got a fire in my belly" all the time, and assumed they'd rewritten the line. If any names don't sound familiar to you, just go to http://www.behindthevoiceactors.com and look them up there. I hadn't had a chance to check recently, that's neat to hear. Brina as Juvia huh? I'm kinda interested to see how that goes. Most of her performances I've heard are of the cute, squeaky voiced character variety. I was going to hold off on buying part two since I have no money, but this is testing that resolve. In the meantime, you'll just have to settle with legendary voice actors like Patrick Seitz as Laxus and Jerry Jewell as Lyon. By the way, Brina Palencia has a HUGE range, as you should (and may or may not) know. She can do VERY deep, practically boyish voices (if you've ever seen the Black Butler dub, she does the voice of Ciel). She can do flat, robotic voices, too; in fact, she's the current voice of Rei in the new Evangelion movies. 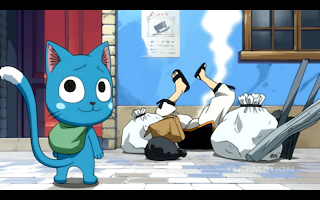 So Juvia cannot be a more perfect role for her. And if you're thinking about whether there will be multi-casting, note it will be kept at a minimum for the time being. Huh, I wonder how I missed that Brina was doing Rei, I own those movies! Yeah, in that case I don't even have to wonder whether she'll do well or not, she's freaking perfect. I have to confess that I haven't seen that many shows with her in it. Like I said, pretty much all the roles I've seen her in were of the squeaky cute voice, like Chopper, Tamama, and Nina Tucker. Though looking through her list of roles I am running across a few that I didn't realize were her. Probably because her performance didn't sound like her to me usual self. I suppose there are enough characters in Fairy Tail that they could need multi-casting, though there are still a few VAs that could take roles. I'm holding out for Vic Mignogna for Ichiya, and I'm still trying to think of someone who would be good for Tatum. I'm actually thinking of someone like Troy Baker for Ichiya. Vic Mignogna could be a good Vidaldus (the KISS knockoff punk rocker) since he's a singer. And if they ever get so far as season 3, he could also be a prime choice for Zancrow or Rustyrose. Just 'cause there's minimal multi-casting doesn't mean there wouldn't be. At first I thought Mignogna should be Hibiki, since he already has experience with playing the Host type character. But then I thought hearing Tamaki's voice coming out of Ichiya would mess with so many Ouran Host Club fans that I pray FUNimation doesn't pass it up. Just as long as they don't multi-cast him too much, he's a great voice actor, but his voice is too distinct for me not to notice it's him. Kinda drags me out of the story sometimes. Hurm, how about Jura for J. Michael Tatum, I could see him with a deep slightly pretentious…ish sounding voice. Kinda a formal voice. 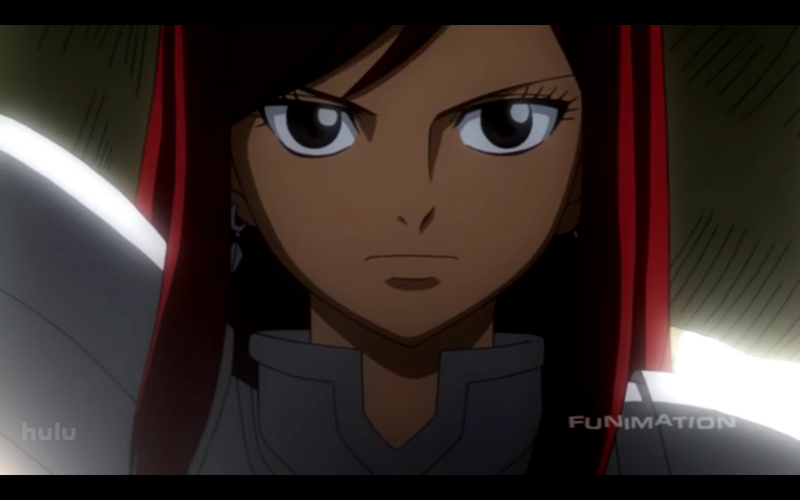 I'd love to know what your thoughts are on Colleen Clinkenbeard as Erza Scarlet. She's my favorite character in the game.